The evening got started by jasonlittle, who put together a terrific multimedia PowerPoint show of the many dream sequences, hallucinations, and other surreal episodes from the Adventures of Tintin. 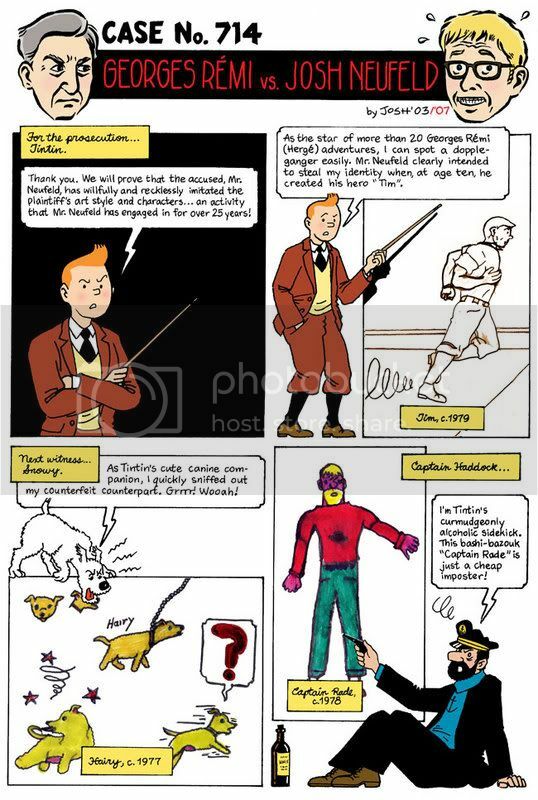 It was a bizarre trip down memory lane, and a great reminder that Hergé, for all his reputation as an exact renderer and the creator of the “clear line” technique, was actually an inspired surrealist. Stepping to the mic next was the eminent Bill Kartalopoulos, who presented a fascinating, deftly delivered PowerPoint show on Hergé, his influences, and the evolution of the “clear line” style. To my mind, it was the perfect counterpoint to the other presentations (including mine), which though they were loving parodies, needed to be balanced with a true appreciation of Hergé’s genius. 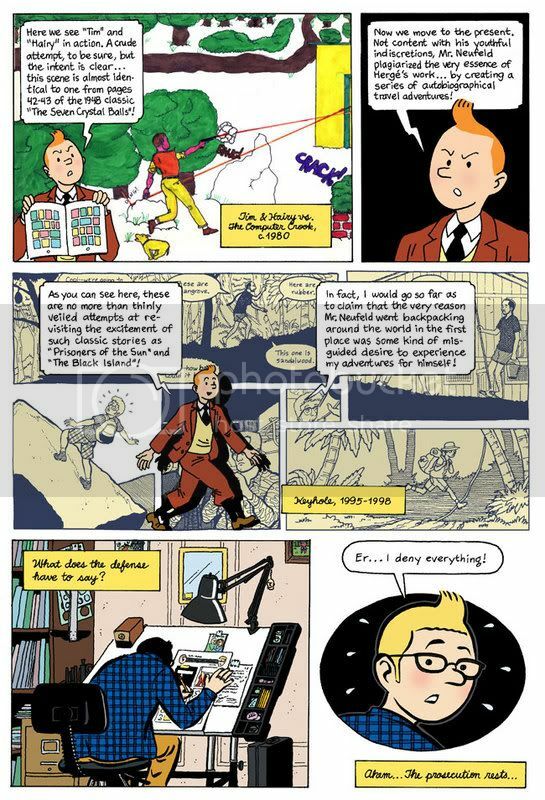 Finally, bertozzi (and the assembled character voice “actors’) presented his wicked Tintin satire, “Nit Nit and the Escapees,” which can be seen in its entirety here: http://www.nickbertozzi.com/comics/nitnit/nitnit.htm. The evening concluded with all assembled treated to a mixture of French pop songs and a showing of the subtitled Anders Østergaard documentary, Tintin & I. In my black market knockoff T-shirt, “Tintin in Vietnam,” and toting my Tintin shoulder bag, I was proud to be part of such a fun evening dedicated to the centennial of my all-time favorite cartoonist. I was proud to be part of it, too, even though I was out of town. thanks, Bob. it was a treat to share the Tintin “stage” with a satirist of your talent. let’s make a date to do it all over again for the master’s 150th! Weird addendum: today is also the 100th anniversary of the birth of the great British actor, Laurence Olivier! May 22, 1907, was certainly an auspicious day for European arts & letters. Twas a special evening indeed. Glad you had a full report.